Robert Farrar Capon was one of my all time favorite writers and I miss him and his engaging and often snarky writing. Capon referred to God as “The Divine Fox.” God is indeed wild and out of control, or at least out of our control. What would Jesus Do? Never something that you would expect, He’s wild and good. This is something that I keep in mind as I go to work in the mission field of Eurasia. Nature abhors a vacuum, so they say. Rationalism, Postmodernism, and the fallout from Communism has torn Christianity from much of Europe. The vacuum was created, and it is being filled by those who are anti-religious and Islam. Our soon to be home of the Czech Republic, is 85% non-religious. Across the board, in Germany, it is very agnostic, but we see the vacuum also being filled by Islam. What you might not be hearing much about is the work of the Divine Fox. I often make the point that the Lutheran Reformation might not have happened if not for Islam. One hundred years before Luther, in what is now Prague, there was Jan Hus, who was saying many of the same things as Luther. As Luther was in Leipzig, he even identified himself as a Hussite. Like Luther, Hus argued that The Lord’s Supper should be received in both kinds, the cup should not be reserved for the priests alone. Hus argued that if the Pope has access to the treasury of merits that he should give away Christ’s forgiveness for free instead of selling it. Hus argued that the Word of God should be proclaimed in the vernacular of the people. 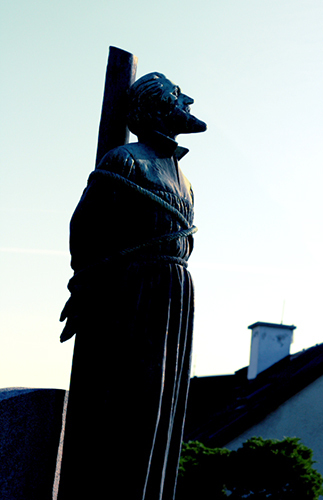 Hus was burned at the stake in his early 40s, Luther lived to a fairly ripe, old age, but why? Islam, that’s why. Okay, maybe not Islam alone, but it was a huge factor. 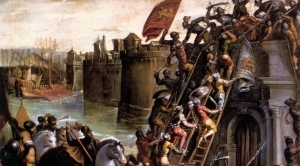 The Turks (Muslims) were pushing on the gates of Austria, and the Holy Roman Empire was in peril. The Emperor needed the Germanic Princes, Dukes and the like to remain loyal to push the Turks out of the Empire. Because of this and because of the fidelity of these Princes and Dukes to the Word of God as proclaimed by Luther, he wasn’t burned at the stake like Jan Hus. The Divine Fox was at work for the sake of the Gospel, and He’s at it again. The Muslims are once again in conquest mode, but it is they who are being conquered by the Gospel. Thousands of Muslim Refugees have been baptized into the family of Christ. The story is common that they have had a dream (serious prophetic stuff in Islam). The dream instructs them to seek out the truth in the Church down the street. One of the most well known of these pastors is Pastor Gottfried Martens at Trinity Church in Berlin. It is reported that Pastor Martens has over a thousand former Muslims in his church and currently has four hundred in his baptismal classes. These classes run for three months so that when these people are baptized, they know exactly what it is that they are believing and confessing. These dear souls are hearing the Word and being baptized, and now they are Christian evangelists. Not only are they evangelizing those from their own countries, but they are also proclaiming the Gospel to those who have no religion in their neighborhoods. The stories are amazing and truly moving, but ultimately, the Divine Fox always gets the last word. I will share more stories from the mission field shortly. In the meantime, we thank God for His mercy toward these lost souls who have been blinded by Islam and Agnosticism. Be encouraged! Christ always gets the last word, and so we wait to see what develops next.